The identification of insecticide residues on crop foliage is needed to make periodic pest management decisions. Electronic-nose (e-nose) methods were developed and tested as a means of acquiring rapid identifications of insecticide residue types at relatively low cost by detection of headspace volatiles released from inert surfaces in vitro. Detection methods were developed for an intrinsically conducting polymer (CP)-type electronic nose gas-sensing device, the Aromascan A32S, to identify and discriminate among eleven insecticides representing eight different classes. A vapor library was developed using diagnostic vapor profile databases (electronic vapor signature patterns) from known insecticides. The A32S e-nose effectively distinguished between eleven different insecticide residues, correctly identifying them at frequencies ranging from 82-99%. The distribution of vapor class components, based on artificial neural net (ANN) training and analysis, indicated the percentage membership of vapor classes shared by insecticide types. 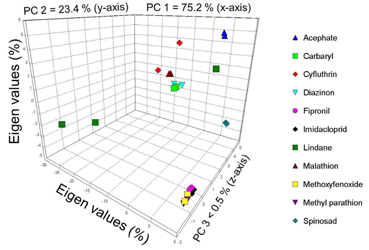 Principal component analysis (PCA) indicated the relatedness of insecticides based on sensor array response patterns (vapor profiles) of individual insecticides. Furthermore, PCA generated precise statistical numerical values (quality factors of significance) that also provided some indications of chemical relatedness between insecticides based on pairwise comparisons of headspace volatiles from individual insecticide types. The potential applications of these methods to the detection and identification of insecticide residues on crop surfaces in the field are discussed.